*All safaris are priced for a minimum of three guests and a maximum of ten. A 30% supplement is charged if only two guests. The ten day Sepopa – Maun safari is priced on a minimum of four guests, if only three guests, we charge a 30% supplement and for two, a 50% supplement. We retain the right to add further guests to trips. * These prices are valid until Dec 2019. 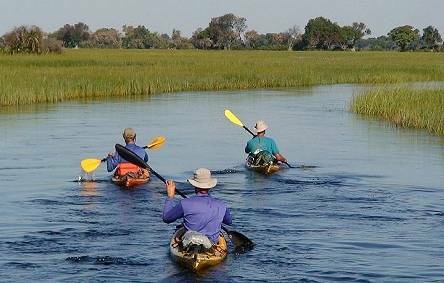 9 night 10 day kayak safari, Sepopa to Maun (300km). This safari is only available in May, June and July and first half of August each year. Includes transport to Sepopa. We supply all camping equipment, tents, bedrolls (with duvet, pillows and linen) chairs, tables, cutlery, crockery, food, ice, snacks and table wine at dinner. All wildlife reserve fees, guide fees, community wildlife area fees and camping fees are included. We carry First Aid kits and on longer trips satellite comms.